is a downloadable application designed exclusively for the Apple Iphone, iPad and Ipods. It works with Iphone 3G S, the original Iphone and the IPod touch and newer versions. Now available in the Apple store via iTunes. The Apple store will notify you when new releases of the applications, are available. A red circle will appear on the App Store Badge on your iPhone Home Screen. When you open the App Store, you will arrive on the updates screen listing applications with new versions ready to download. Select the Tennis Quiz item to automatically download the new version. Select the language that you want to use: English, Danish, Croatian, Bosnian, Serbian..
A 20 question multiple-choice test has a four possible answers. You got 20 sec to answer. We play tennis because we love it. Only the highest scores will be saved. Share your score on Facebook and Twitter. 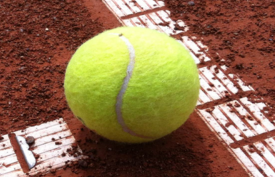 Tests your knowledge about the tennisgame, tactics,strategy, player style, rules and regulations on ATP and WTA tournaments, advantages and disadvantages of playing surface, etc. If you have any questions regarding the installation please visit our lists of Frequently Asked Questions. If you cannot find the answer to your question, please let us know.